Fresh off the press (in book stores in May 2016) comes the 7th edition of one of the “sacred” books for adventure motorcycling. Almost 400 pages which everyone will enjoy, especially if you are thinking of a round-the-world tour, seen as the author, Chris Scott, gives advice on travelling through Asia, Africa, and Latin America. 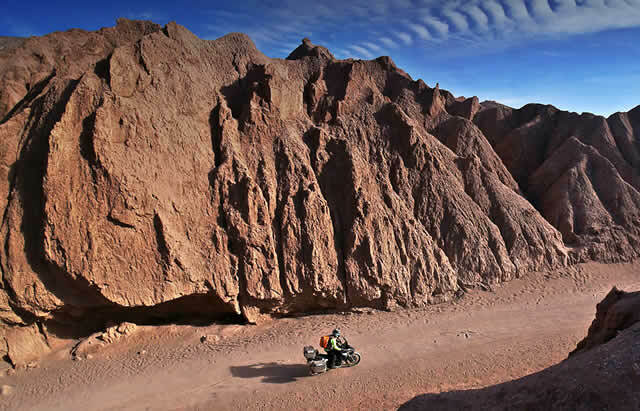 Te novelty in this edition of the “Adventure Motorcycling Handbook” are the extremely useful, detailed updates and extensions (around 100 pages) on the countries he describes. Keep on reading! 2016 marks the 25th anniversary of this well known book, revised 7 times by the author since its first publication. On the cover of this new edition Ewan McGregor says: “The first thing we did was to buy this guide“. We believe he is referring to the period when he was planning the motorbike trip we all know of. 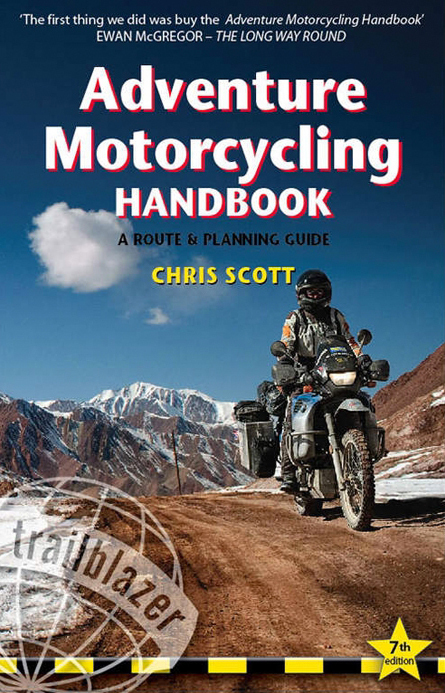 A curiosity: the term “Adventure motorcyclist” was apparently invented by Chris Scott (he appears to have first used it in the 90s). AMH7 has been expanded and updated and contains a lot of useful info, often difficult to find in other specialised books or magazines. 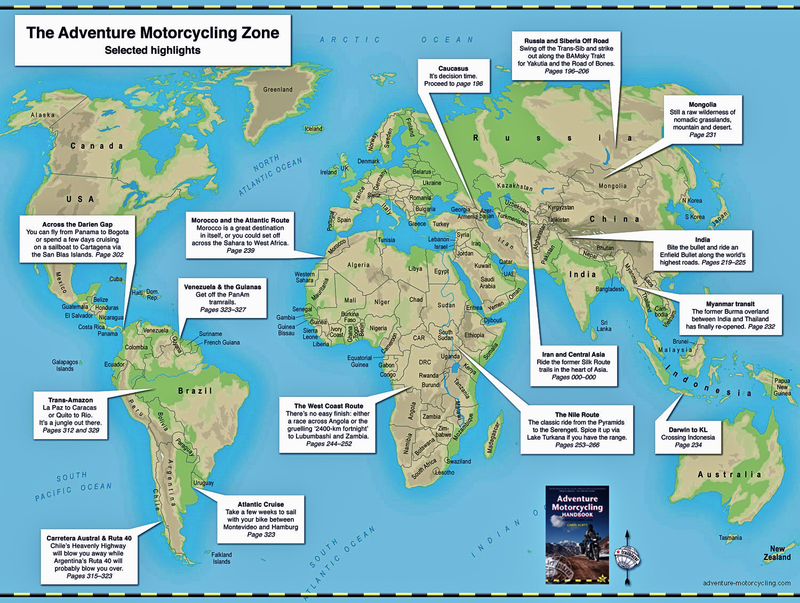 But what makes this book really special are the contributions of over 30 people, all expert bike adventurers and globetrotters (Lois Pryce, Walter Cloebatch, Gaurav Jani, Grant Johnson, Nick Hill, to name but a few). Practical information, essential documentation, detailed preparation of luggage and tools for riding in all the countries of the developing world (the AM zone), borders, how to cope with accidents and medical emergencies in general, transportation, navigation, camping in the wild, from motorways to off-road riding, the diagnosis of the most common breakdowns and also a overland guide for quads, trans-continental routes for Africa, Asia and Latin America, the updated mapping of the itineraries and riding stories from the pioneers to the present day, with first hand reports in India, Morocco, South America, Pakistan and Siberia. Those who have already read the book say “This book is worth many times its weight in gold” (half a kilo). Immagini: 40 colour photos, 120 photos in black and white, 10 illustrations in black and white.